Growing old together with my Elizabethan 23, Reservation, is a strange experience. While she goes on happily after a life of 40 years, I am not so fortunate. I find that now, at twice her age, I am losing strength in my limbs and becoming less stable and confident on my feet. In fact, during a singlehanded trip to the Baltic last summer I faced a number of incidents. One of the worst was taking an involuntary swim after the wash from a passing ship threw me overboard whilst stowing the anchor chain. I had always believed that I would be able to clamber up the struts of the self-steering gear, but to my dismay I found that I didn’t have enough strength to do it, even though I was only wearing shorts and deck shoes. I then tried to get a foothold on a bight of the genoa sheet and was just about able to reach the grabrail on the cabin top, but no further. Fortunately the water was warm so there was no need for panic. I was still trying to find a way out when I was spotted drifting into the shipping lanes of the Kiel Förde. I was eventually fished out and soon back on my way, none the worse for the experience – except for being covered in blue antifouling! I decided on a refit to make life easier and safer. A means of getting back on board was clearly a priority and I gave much thought to a solution during the remainder of the trip and during lay-up. 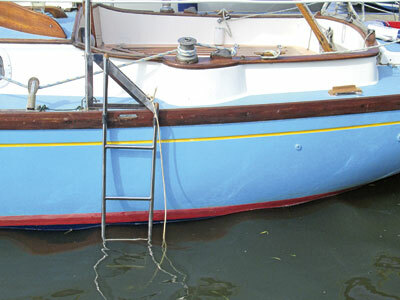 It was a difficult one – the reverse transom and steering gear ruled out a stern ladder and I had tried rope ladders in the past but found the lower rungs just slipped away under the boat. I realised that the ideal position would be between the last stanchion and the pushpit leg, filled on most boats by dodgers. However it seemed an insurmountable problem to get a reasonable length ladder to launch while I was clinging to the toerail. This haunted me for months until, during a restless night I had my eureka moment. The answer was to hinge the ladder on a forty-five degree triangle attached to the boat’s stanchion. I made a cardboard model with seizing wire rings as the hinge rings on the diagonal. This seemed to work, so the next stage was to make up a full size mock-up with broomsticks, wooden slats and bow shackles as hinges. Fitting this to the stanchion revealed problems as the fold-down ladder would not clear the hull. It was evident that the ladder would need spacers at the hinges and webs to the stanchion to make the triangle upright. Happy that it all worked I then made a full-size drawing. Armed with this and the mock-up I approached my friend, Peter Crouch, with the possibility of making it in stainless steel. Being a brilliant steel fabricator he was able to suggest several practical solutions. Stainless rings replaced the bow shackles on the two hinges. I had thought of collars of tubing to fix the triangle to the stanchion but he was afraid of welding distortion and came up with the better solution of using sprayhood fittings. 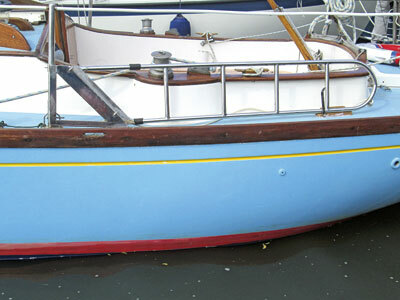 Peter is a fast worker and, with his workshop PC Fabrications being next to the water at Rossiter Yachts, Christchurch, it was soon installed with only a few minor alterations. It all fitted neatly, but I had to make a few modifications. I had thought that the triangle would be able to swivel on the stanchion, but it was soon evident that it needed to be pinned through rigidly. All it now needed was a housing chock and a release lever that could be reached from the water. I was truly amazed at the result and the ladder is far less obtrusive than I had imagined. Neither does it interfere with any of the sailing operations because that part of the deck is too narrow to walk around anyway. The real advantage of the ladder is that it can be employed in seconds and the bottom rung is more than the depth of my lower leg, which should make it easy to get a foothold. I had a concern that the necessarily slack hinge ring, though welded at right angles to the spacer, would rattle in a seaway or at anchor, but it has proved to not be so. It has been such a success that I have even thought of having one made for the other side. Of course, I can now see where it could have been improved. A stay could have replaced the triangle, but this would have been complicated. The water is too cold to test the ladder out at the moment, but who knows, its first use might be to help some other unfortunate having his own impromptu swim! Jim, 79, was born in Cambridge and had his interest in boats and the sea ignited by the books of Arthur Ransome. 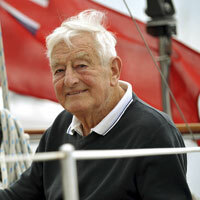 He spent 13 years in the Merchant Navy, during which time he taught himself to sail an engineless 30ft Broads yacht. 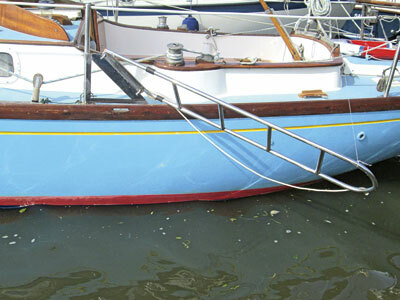 He then took up boatbuilding on the Broads, which he continued after moving to Rossiter Yachts at Christchurch in 1974. Jim bought his Elizabethan 23, Reservation, in 1980, and has cruised her round Britain three times.